Seattleites now have three new places to increase their pizza intake, with Chicago-style deep-dish pies at Windy City Pie in Phinney, wacky combos (spaghetti and meatballs on pizza?) alongside boozy slushies at Supreme in University District, and margherita pies and more at Wallingford's new cozy-casual Italian spot Fiasco. Meanwhile, Ballard Pizza Company in South Lake Union says goodbye. Read on to learn more about all that plus essential food events for your weekend, like Taste Washington and Plate of Nations. For more things to eat and drink, try our list of food and drink specials to try in March and our food and drink calendar. After Neon Taco closes its walk-up window inside Nacho Borracho on Sunday, chef Ricardo Valdez, who left London Plane last month, will open El Xolo, his Mexican window with Pacific Northwest influences, in the space the following day, April 1. El Xolo will focus on tacos made with handmade tortillas (with masa made with heirloom corn from Central Mexico and freshly ground in-house). Other offerings include nachos, "California burritos" (a San Diego staple with French fries tucked inside), and tlayudas (an Oaxacan dish often referred to as "Mexican pizza," with a flatbread-like tortilla covered with refried beans and other toppings). This new casual Italian restaurant from Heavy Restaurant Group (which also owns Purple Cafe and Wine Bar, Barrio, Lot No. 3, The Commons, Pablo y Pablo, and Claret) replaced their previous restaurant Thackeray on March 19 and is now open for lunch, brunch, and dinner. The menu features salumi and cheese, antipasti, salads, ciabatta sandwiches, pizza with options like classic margherita and the "Liv and Buddy" (pepperoni, sausage, ricotta, tomato sauce), and pasta dishes like cacio e pepe and pappardelle bolognese, plus cocktails and desserts. Brunch options include breakfast pizza and shakshuka. West Seattle restaurateur Mark Fuller, owner of Ma'ono and New Luck Toy, has brought the boozy-slushies-and-pizza concept of his West Seattle bar Supreme to the former space of Pagliacci's original location. The offbeat combos include the Ono (fried chicken, kimchi, and American cheese) and the Broken Meatball (spaghetti, fresh mozzarella, basil, parmesan, garlic). Pizza is available by the whole pie or slice. This new barbecue restaurant serving brisket, ribs, pulled pork, and other smoked meats, as well as sides like mac and cheese and collard greens, is now open in the University District. Guests also have the option to order the meats in a burrito. Dave Lichterman's wildly popular Chicago-style pizzeria, which previously was located inside Interbay's Batch 206 Distillery, is now softly open in its new location in Phinney Ridge and will have its grand opening on April 3. The new location is bigger and family-friendly, and features booths and a full bar, with beverages like the bitter Chicago liquor Jeppson's Malört. The South Lake Union location of Ethan Stowell's pizzeria has shuttered due to insufficient traffic. The restaurant's Ballard and Frelard locations will remain open. The Heathman Hotel in Kirkland closed its restaurant Trellis on March 22. Trellis will be replaced by Hearth, a new restaurant concept with food cooked over a wood-fired hearth oven, coming sometime this spring. Toronado owner Matt Bonney, a beloved fixture of the Seattle beer scene who had 15 years of experience in the industry and who helped establish institutions like Bottleworks, Brouwer’s Cafe, and the Burgundian, died unexpectedly over the weekend. Friends in the beer community are mourning the loss. Following the announcement of the semi-finalists for the James Beard Awards, the list of finalists has been released. The remaining Seattle-area finalists are Canlis for Outstanding Service; Brady Williams of Canlis and Rachel Yang and Seif Chirchi of Joule for Best Chef: Northwest; and Heliotrope Architects and Price Erickson Interior Design for Willmott's Ghost for Outstanding Restaurant Design 75 Seats or Under. FareStart will temporarily close next Tuesday, April 2, to renovate its interior. The restaurant currently has no official reopening date but hopes to re-open in early May, with new furniture and the addition of beer and wine. The restaurant's Thursday guest chef nights will move to their sibling restaurant Maslow's for the time being. Sea-Tac's Central Terminal, which has been closed for a year for renovations, re-opens today with five new restaurants, including Lucky Louie Fish Shack, Evergreens Salad, Pallino Pastaria, Pei Wei Asian Kitchen, and Koi Shi Sushi Bento. Earlier this week, the airport also added Bambuza Vietnam Kitchen to its N Gates. Other restaurants, like Li’l Woody’s, Sunset Fried Chicken, Good Bar, Macrina Bakery, and Caffe Ladro, are planned to join the new additions. The Fremont pub will offer a special food and cocktail menu in light of Britain's secession from the European Union. The organizers add: "No matter your point of view, it is a truly good reason to head out to the pub on a Friday night." Try wines from Napa Valley's Freemark Abbey, paired with dishes like crab-stuffed tempura mushrooms, charred kale with warm truffle vinaigrette, and smoked geoduck clam chowder. Immerse yourself in four days of pure oenophilia with this behemoth event billing itself as “the nation’s largest single-region wine and food event,” which unites more than 235 Washington wineries, 65 local restaurants, and a number of acclaimed local and national chefs. Dress yourself in rouges et blancs (and drink accordingly) for the Red and White Party, taste food and wine and view chef demonstrations at the Grand Tasting, and hobnob with buzz-worthy chefs like Edouardo Jordan and Rachel Yang while eating fancy food and drinking wine cocktails at the New Vintage event. Plus, sign up for special farm visits, seminars, winemaker dinners, and Sunday brunch at Palace Ballroom. Botanicals and Brunch with Bloom and Grow Radio! Nosh on treats from Raised Doughnuts, sip botanically inspired brunch cocktails (or coffee), and talk plants with Maria from Bloom and Groom Radio. Bring Fido and be the first to try Chainline's new canine-themed "Fluff" IPA—$1 of every pint sold will go to PAWS. 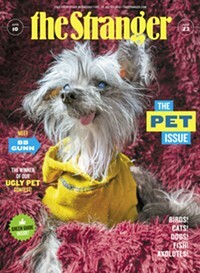 Plus, treat your pet to some dog beer and cash in on swag giveaways for pups and humans alike. At this pop-up inspired by the menu at Mitch Mayers's up-and-coming Ballard restaurant Sawyer, consume doughnuts in flavors like creme brulee, everything bagel, chocolate peanut butter, and cuatro leches. Known for being Seattle’s oldest neighborhood, industrial-gritty Georgetown is quietly becoming a culinary destination, with a high concentration of underrated under-the-radar gems. Consider: the cask-aged beer of Machine House Brewery, the fiery hot chicken of Sisters and Brothers, and the beer-battered, deep-fried tacos of El Sirenito, to name a few. At this annual spring food walk, you can scoop up all those and other offerings from more than 30 different vendors, like the artful cakes of Deep Sea Sugar and Salt and the upscale vegetarian pub fare of Georgetown Liquor Company. Thirteen Skagit Breweries will pair their offerings with bites from Skagit Valley Restaurants and farmers at this event that's part of the La Conner Daffodil Festival and Skagit Beer Week. To keep the valley pride going, three Skagit bands will play live sets—Jacob Navarro, the Sky Colony, and Whiskey Fever. Chef David Wynne will prepare a menu of dishes like smoked salmon and chevre-filled crepes and duck confit alongside wine pairings from Vitale. This lavender-themed fundraiser for the LoveYourBrain Foundation will feature lavender mocha doughnuts made with Armistice Coffee Roaster's house roast. Can't get enough Great British Bake-Off? At Machine House's "mildly competitive" monthly potluck, watch contestants vie to turn out the best cakes, pies, breads, and loaves, judged by votes from other participants and patrons (one drink buys you one voting token). Competitors can win bonus points for including Machine House brews in their bakes, and the baker with the most tokens at the end of the six months will be crowned the victor and win a $100 gift card, trophy, and custom bake-off champion apron.